"Sunday . . . was the most unbelievable day of tournament golf I have seen in many years. What a finish!" Jack Nicklaus wasn't overselling the tournament he created and to which he had contributed several helpings of memorable moments. What a finish indeed; what a stunning drama; what an indelible eighteenth (72nd) hole picture of Paul Azinger on his knees in a greenside bunker, visor and wedge raised above his head, face contorted with elation - and maybe disbelief - as his ball meandered 15 feet across Muirfield's lush finishing green and lazily plunged into the cup! But epochal as that birdie was for the in-person gallery of thousands, plus the usual uncounted millions on ABC's television waves, the full impact would only be magnified by the ensuing 10 minutes. At that point, the hole-out assured Azinger only of a place in a play-off, if one developed. 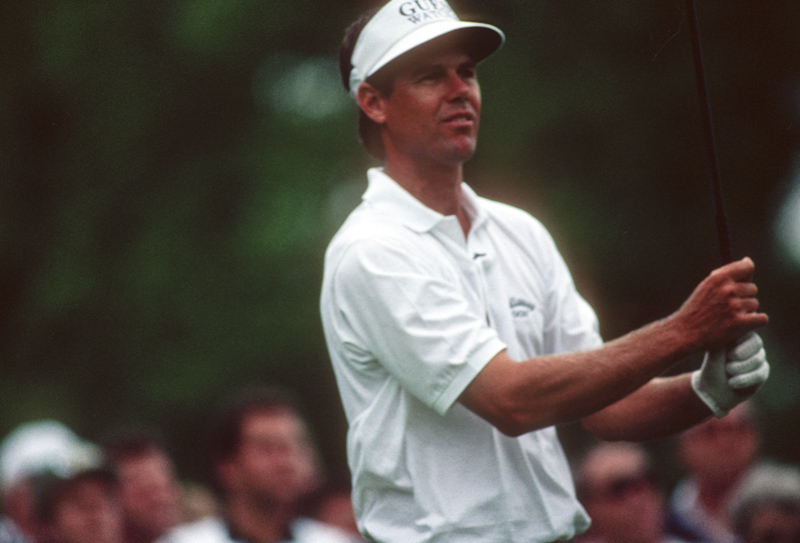 He had trailed his closest TOUR buddy, Payne Stewart, by a shot coming to No. 18 (270 - 271) and shared second with fast-finishing challenger Corey Pavin at 13-under. Both Stewart, leader by three strokes at 54 holes, and Azinger had strayed into the deep left-front bunker with their second shots, but Stewart was "plugged" in the sand and away. A marvelous explosion set him up for an eight-foot, downhill par that would seemingly crown him 1993 Memorial champion - after a second and two thirds in his last four Muirfield starts. With a good lie in the bottom of the bunker, 10 feet closer to the green than Stewart, and needing about a six-foot rise to clear the grassy lip, Azinger recalled of his hole-out, "I wasn't thinking of how high I had to go, I just wanted to be sure and clear that lip to the edge (of the putting surface) and just roll it. I didn't want to blow myself out of it with a bogey." After the cheering and buzzing over Azinger's miracle three had sub-sided, Stewart assumed center stage, suddenly facing the reality of converting the 8-foot putt to force a playoff. He missed, left, by two feet to hand Azinger the Tournament championship. The gallery gasped, then groaned sympathetically as Stewart missed again for double bogey and third place behind Pavin. As the 18th Memorial winner, Azinger became $252,000 richer with a 69-274, 14 under par, Pavin slipped into second at 67-275 and Stewart skidded to 74-276 (Stewart had been under 70 for his previous five rounds at Muirfield). Eight other players were within four shots of the top. Savoring his 9th career TOUR win, Azinger admitted to an emotion he once disdained. "I had tears in my eyes before I came out of the bunker," he confessed. "I can remember in '86 when (Bob) Tway won the PGA (by holing a similar bunker shot) and he cried, I said, 'what a baby!' I'd never cry at a golf tournament. "But I couldn't help it. It was such a shock for it to go in and then my best friend on TOUR's out there and I did it to him." "On a good golf course like this, the cream comes to the top," said a gracious Stewart. "I curdled." "We played unbelievably coming in," reported former Florida Stater Azinger. "I probably hit some of the best shots I've ever hit coming down the stretch. Tee to green, I don't know if I could have been much better." The hole-out by Azinger and hole misses by Stewart were the piece de resistance in literally a smorgasbord of excitement served up for Memorial galleries on a sunny Sunday, atoning for three previous days of - again! - less than Chamber of Commerce weather. With four holes to play, 10 pros stood within two strokes: Stewart at 13 under; Azinger at 12; Pavin, Fred Couples, Greg Norman, Jay Haas, Jumbo Ozaki, Bill Glasson, Jim McGovern and Brad Faxon at 11 under. Pavin, six strokes back, started with birdies on Nos. 3, 4 and 5, picked up two more on Nos. 15 and 16. His bunker explosion on No. 17 hit the flagstick and stopped two feet away and his 45-foot putt for a birdie on No. 18 missed by about an inch. Norman began the round eight off the pace, but appeared to be on another rally with four birdies in six holes (Nos. 3, 6, 7, 8), and finished 67-277. Ozaki managed birdies on three of the final four holes to tie Norman and their 11-under total was later equaled by Couples, Haas, Faxon and McGovern. By the clubhouse turn, Azinger had caught Stewart and Couples trailed by one, Pavin by two. Stewart, clad in Cleveland Browns colors, pulled ahead with a birdie at No. 12 and both he and Azinger birdied No. 15 to set the stage for the home hole heroics. "The last nine was like counterpunching," Azinger decided. Forty-seven of the 73 players who made the 36-hole cut finished under Muirfield's 288 par. Davis Love III and Donnie Hammond liked the damp fairways and greens on Thursday, sharing first at 34-32 - 66 and 32-34 - 66 respectively as 58 of the 114 starters broke par (72), third-highest number in the 18 Memorials. Eight carded 67's in second place, including 1991 Champion Kenny Perry and Couples, each with outgoing 31's, and the Ozaki brothers, Joe and Jumbo. Azinger was among six at 68, Stewart at 69. Tournament Founder Nicklaus had his best start in the last seven Memorials, a 70. Stewart, with a 66, and Couples, with a 68, shared the second round lead at 135, with Norman at 136 and Azinger moving into fourth at 137. Weather forced a 3-1/2 hour delay, stranding the final 18 players, including Love. He finished the next dawn with a 72. With a 5-under-par 67, Stewart equalled the second-best 54-hole total in Memorial history, 14-under-par 202. On a rain-softened course and in 15 mph winds, he didn't hit a bunker for the second straight round, had only one bogey for the third straight day and carved the best score in the field for the second straight day. Azinger survived a double bogey on No. 10 to squeeze into second place with a 68-205, followed by Bill Glasson, 206, Jim McGovern and Love at 207. Couples tied Stewart at 10-under with birdies on two of the first incoming-nine holes, but fell back to 208. Two stingy strokes by the Wadkins brothers distinguished Memorial 18. Lanny sank a 3-iron on the par-3, 204-yard No. 4, the Tournament's eighth hole-in-one, and Bobby achieved the first-ever double eagle, holing a 4-wood (237 yards) on the 490 yard No. 15 in the first round. The ball rolled about 20 feet to reach the cup. Robert Gamez became a note at the other end of the scale during the third round, dumping four balls into the pond on No. 3 and finally holing out with an 8-over-par 12. He also had seven birdies - after 11 in rounds 1 and 2 - for a 76-218. He joined the Memorial's previous "dozen club" members Fulton Allem, 12 on No. 11 in 1988 and Jim Simons, 12 on No. 16 in 1990. After an encouraging start, Nicklaus finished with a 298, including a closing 72. He led off the Sunday field with a marker, his son Jackie. The spectacular Sunday finish seemed entirely appropriate, because the week had already been made special by the reign of Arnold Palmer as 1993 Memorial Tournament honoree/contestant. Thousands of fans braved a steady rain to cheer Arnold's induction during Wednesday ceremonies at the 18th green and his "Army" remained faithful - and appreciative- during an opening round 73. He missed the cut at 81-158.